Thomas Howard, 2nd Duke of Norfolk KG PC (1443 – 21 May 1524), styled Earl of Surrey from 1483 to 1485 and again from 1489 to 1514, was an English nobleman and politician. He was the eldest son of John Howard, 1st Duke of Norfolk, by his first wife, Catharina de Moleyns. The Duke was the grandfather of both Queen Anne Boleyn and Queen Catherine Howard and the great grandfather of Queen Elizabeth I. He served four monarchs as a soldier and statesman. 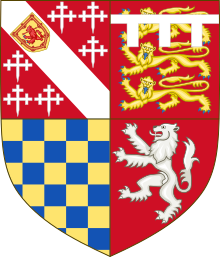 Thomas Howard, 2nd Duke of Norfolk, was born in 1443 at Stoke-by-Nayland, Suffolk, the only surviving son of John Howard, 1st Duke of Norfolk, by his first wife, Katherine, the daughter of Sir William Moleyns (died 8 June 1425) and his wife Margery. He was educated at Thetford Grammar School. While a young man, he entered the service of King Edward IV as a henchman. Howard took the King's side when war broke out in 1469 with the Earl of Warwick, and took sanctuary at Colchester when the King fled to Holland in 1470. Howard rejoined the royal forces at Edward's return to England in 1471, and was severely wounded at the Battle of Barnet on 14 April 1471. He was appointed an esquire of the body in 1473. On 14 January 1478 he was knighted by Edward IV at the marriage of the King's second son, the young Duke of York, and Lady Anne Mowbray (died 1481). After the death of Edward IV on 9 April 1483, Thomas Howard and his father John supported Richard III. Thomas bore the Sword of State at Richard's coronation and served as steward at the coronation banquet. Both Thomas and his father were granted lands by the new King, and Thomas was also granted an annuity of £1000. On 28 June 1483, John Howard was created Duke of Norfolk, while Thomas was created Earl of Surrey. Surrey was also sworn of the Privy Council and invested with the Order of the Garter. In the autumn of that year Norfolk and Surrey suppressed a rebellion against the King by the Duke of Buckingham. Both Howards remained close to King Richard throughout his two-year reign, and fought for him at the Battle of Bosworth in 1485, where Surrey was wounded and taken prisoner, and his father killed. Surrey was attainted in the first Parliament of the new King, Henry VII, stripped of his lands, and committed to the Tower of London, where he spent the next three years. A painting by Mather Brown depicting Norfolk defending his allegiance to Richard III before Henry VII after the Battle of Bosworth Field. Howard was offered an opportunity to escape during the rebellion of the Earl of Lincoln in 1487, but refused, perhaps thereby convincing Henry VII of his loyalty. In May 1489 Henry restored him to the earldom of Surrey, although most of his lands were withheld, and sent him to quell a rebellion in Yorkshire. Surrey remained in the north as the King's lieutenant until 1499. In 1499 he was recalled to court, and accompanied the King on a state visit to France in the following year. In 1501 he was again appointed a member of the Privy Council, and on 16 June of that year was made Lord High Treasurer. Surrey, Bishop Richard Foxe, the Lord Privy Seal, and Archbishop William Warham, the Lord Chancellor, became the King's "executive triumvirate". He was entrusted with a number of diplomatic missions. In 1501 he was involved in the negotiations for Catherine of Aragon's marriage to Arthur, Prince of Wales, and in 1503 conducted Margaret Tudor to Scotland for her wedding to King James IV. Surrey was an executor of the will of King Henry VII when the King died on 21 April 1509, and played a prominent role in the coronation of King Henry VIII, in which he served as Earl Marshal. He challenged Thomas Wolsey in an effort to become the new King's first minister, but eventually accepted Wolsey's supremacy. Surrey expected to lead the 1513 expedition to France, but was left behind when the King departed for Calais on 30 June 1513. Shortly thereafter James IV launched an invasion, and Surrey, with the aid of other noblemen and his sons Thomas and Edmund, crushed James's much larger force near Branxton, Northumberland, on 9 September 1513 at the Battle of Flodden. The Scots may have lost as many as 10,000 men, and King James was killed. The victory at Flodden brought Surrey great popular renown and royal rewards. On 1 February 1514 he was created Duke of Norfolk, and his son Thomas was made Earl of Surrey. Both were granted lands and annuities, and the Howard arms were augmented in honour of Flodden with an escutcheon bearing the lion of Scotland pierced through the mouth with an arrow. In the final decade of his life, Norfolk continued his career as a courtier, diplomat and soldier. In 1514 he joined Wolsey and Foxe in negotiating the marriage of Mary Tudor to King Louis XII of France, and escorted her to France for the wedding. On 1 May 1517 he led a private army of 1,300 retainers into London to suppress the Evil May Day riots. In May 1521 he presided as Lord High Steward over the trial of Edward Stafford, 3rd Duke of Buckingham. According to Head, "he pronounced the sentence of death with tears streaming down his face". By the spring of 1522, Norfolk was almost 80 years of age and in failing health. He withdrew from court, resigned as Lord Treasurer in favour of his son in December of that year, and after attending the opening of Parliament in April 1523, retired to his ducal castle at Framlingham in Suffolk where he died on 21 May 1524. His funeral and burial on 22 June at Thetford Priory were said to have been "spectacular and enormously expensive, costing over £1300 and including a procession of 400 hooded men bearing torches and an elaborate bier surmounted with 100 wax effigies and 700 candles", befitting the richest and most powerful peer in England. After the dissolution of Thetford Priory, the Howard tombs were moved to the Church of St Michael the Archangel, Framlingham. A now-lost monumental brass depicting the 2nd Duke was formerly in the Church of St. Mary at Lambeth. Elizabeth Howard, married Thomas Boleyn, 1st Earl of Wiltshire, and was mother of Queen Anne Boleyn, and grandmother of Queen Elizabeth. Catherine Howard, married firstly, Rhys ap Gruffydd. Married secondly, Henry Daubeney, 1st Earl of Bridgewater. Elizabeth Howard (died 1536), married Henry Radclyffe, 2nd Earl of Sussex. ^ a b c d e f g Head 2008. ^ Richardson 2004, p. 236; Gunn 2008. ^ a b c d e f g h i j k l Douglas Richardson. Plantagenet Ancestry: A Study In Colonial And Medieval Families, 2nd Edition. 2011. pg 267-74. ^ a b c d e f g h i j Douglas Richardson. Plantagenet Ancestry: A Study In Colonial And Medieval Families, 2nd Edition. 2011. pg 523–5. Cokayne, George Edward (1912). The Complete Peerage edited by the Honourable Vicary Gibbs. II. London: St. Catherine Press. Cokayne, George Edward (1916). The Complete Peerage edited by the Honourable Vicary Gibbs. IV. London: St. Catherine Press. Cokayne, George Edward (1936). The Complete Peerage, edited by H.A. Doubleday. IX. London: St. Catherine Press. Cokayne, George Edward (1945). The Complete Peerage, edited by H.A. Doubleday. X. London: St. Catherine Press. Cokayne, George Edward (1953). The Complete Peerage, edited by Geoffrey H. White. XII, Part I. London: St. Catherine Press. Davies, Catherine (2008). Howard (née Tilney), Agnes, duchess of Norfolk (b. in or before 1477, d. 1545), noblewoman. Oxford Dictionary of National Biography. Archived from the original on 2 November 2012. Retrieved 12 March 2011. Gunn, S.J. (2008). Knyvet, Sir Thomas (c.1485–1512), courtier and sea captain. Oxford Dictionary of National Biography. Archived from the original on 2 November 2012. Retrieved 13 March 2011. Head, David M. (2008). Howard, Thomas, second duke of Norfolk (1443–1524), magnate and soldier. Oxford Dictionary of National Biography. Archived from the original on 29 September 2011. Retrieved 12 March 2011. Hughes, Jonathan (2007). Boleyn, Thomas, earl of Wiltshire and earl of Ormond (1476/7–1539), courtier and nobleman. Oxford Dictionary of National Biography. Retrieved 13 March 2011. Knafla, Louis A. (2008). Stanley, Edward, third earl of Derby (1509–1572), magnate. Oxford Dictionary of National Biography. Archived from the original on 2 November 2012. Retrieved 13 March 2011. Loades, David (2008). Howard, Sir Edward (1476/7–1513), naval commander. Oxford Dictionary of National Biography. Archived from the original on 2 November 2012. Retrieved 13 March 2011. McDermott, James (2008). Howard, William, first Baron Howard of Effingham (c.1510–1573), naval commander. Oxford Dictionary of National Biography. Archived from the original on 2 November 2012. Retrieved 12 March 2011. Richardson, Douglas (2004). Plantagenet Ancestry: A Study in Colonial and Medieval Families, ed. Kimball G. Everingham. Baltimore, Maryland: Genealogical Publishing Company Inc. Retrieved 17 March 2011. Riordan, Michael (2004). Howard, Lord Thomas (c.1512–1537), courtier. Oxford Dictionary of National Biography. Archived from the original on 2 November 2012. Retrieved 12 March 2011. Ridgard, John (1985). Medieval Framlingham. 27. Woodbridge: Suffolk Record Society. Warnicke, Retha M. (2008). Katherine (Catherine; nee Katherine Howard) (1518x24-1542), queen of England and Ireland, fifth consort of Henry VIII. Oxford Dictionary of National Biography. Archived from the original on 2 November 2012. Retrieved 13 March 2011. This article incorporates text from a publication now in the public domain: Mandell, Creighton (1891). "Howard, Thomas II (1473-1554)". In Lee, Sidney. Dictionary of National Biography. 28. London: Smith, Elder & Co. pp. 64–67. This page was last edited on 7 April 2019, at 01:09 (UTC).